As a researcher in healthcare space, I have got several opportunities to closely interact with healthcare practitioners. Where corporate hospitals and commercialisation of the whole healthcare system has deeply compromised the patient care, there are doctors who care more about a human life rather than targets and high profits. These doctors are not trying to improve their hospital technology to attract more money rather their intention is to provide better care, their efforts are more in making sure that the patients are treated well. 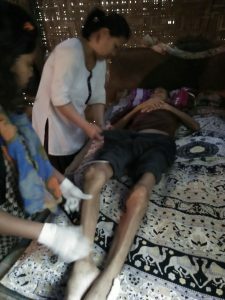 I would like to share one such incidence during my visit to Christian Institute of Health Sciences and Research (CIHSR), Nagaland (http://cihsr.in/), where our team was supposed to go to nearby villages to understand technology requirements for NRHM workers and peripheral health centre. On the way, Dr. Rohan Ramesh (http://cihsr.in/?s=rohan), took a patient to drop to his house where he lives alone. He was severely affected by malnutrition and liver cirrhosis with sores all over his body. They came to know about this patient through a neighbour and immediately took the patient to the referral hospital where they took great care of the patient and brought him back to life. The patient had no family so community health department raised funds through the donation to treat him. And now, when he is better they are on their way to drop him back. The ambulance stopped and I was standing near the vehicle observing what is happening. I was taken aback when the doctor lifted the patient out of the ambulance with a bed-sheet. He was safely placed on his bed, neighbours were informed about his medications and dressing. They realized that the hut in which the patient is living is very dark and damp so they decided to open a window so that patient can get fresh air to breathe. He was very weak to get up on his own, so they made an arrangement so that he can hold the rope tied to the ceiling to get up from his bed. I was observing all this from a distance and this episode provoked a lot of questions in my head. I started wondering what makes this young and dynamic doctor leave a lucrative job and stay in such remote location? What is driving him? Why is he not thinking of making big money? I was scared to ask such thought-provoking question but then I couldn’t stop myself and asked him about his journey. That was even more interesting, he was a very fun loving member of a rock band. After finishing his MBBS, he travelled to many cities performing with his band, enjoying all luxuries. Deep within his heart was yearning to serve the people, that’s when he decided to give up all and serve people. It was an eye-opening experience for me, but then reality is that although they have the heart to serve and passion to follow, they need financial support to carry out their journey without many hurdles. Last time I met him in Bangalore, when he came to meet a few CSR heads to raise fund for telemedicine project. I salute these practitioners who sacrifice their lucrative salaries at corporate hospitals and serve people. Cheers and good wishes to the entire team from CIHSR for supporting the needy cause to the serve the people of Nagaland!